Sponsored by Oregon Forest Resources Institute (OFRI), the Oregon Forests and Water Symposium disclosed emerging conclusions from three large studies that are examining the relationship between managed forests and water resources. Free and open to the public, the symposium was held at the OSU CH2M HILL Alumni Center. This presentation was part of the Starker Lectures Series, hosted by the Oregon State University College of Forestry. All presentations and audio files are available here. Keynote presentation delivered by Richard Whitman at the Oregon Forestry and Water Symposium. This symposium, sponsored by Oregon Forest Resources Institute was held in Corvallis, Ore. on February 28, 2012. Mike Cloughesy reviews the three paired watershed studies of the Watersheds Research Cooperative. This presentation was part of a larger watershed science symposium held in Corvallis, Ore. on February 28, 2012. It is also part of the Starker Lectures Series. This is an opportunity to begin the very important dialogue between watershed study scientists and Oregon forest and water quality policy makers. It is this dialogue which ultimately will facilitate sciencebased policy decisions for Oregon’s forested streams and therefore is one of the more important outcomes of the research you are going to hear about today. Workshop hosted by SAF/OSU on June 4, 2014 in Coos Bay. This one-day workshop focused on practical applications in managing forest vegetation. Speakers addressed best management practices, current issues, problem weeds, and safety. Pesticide license and Continuing Forestry Education credits were offered. A presentation by Andy Hulting, Dept. of Crop and Soil Science, Oregon State University. You are invited to OSWA’s 54th Annual Meeting and the Outstanding Tree Farmers of the Year Woods Tour, Thursday through Saturday, June 26th, 27th, and 28th. Hosted by OSWA’s Douglas County Chapter, this year’s meeting will be held at the Seven Feathers Casino Resort in Canyonville and the Saturday woods tour will be on Rick and Audrey Barnes’ Nickel Mountain Tree Farm near Riddle. Rick and Audrey are Oregon’s 2013 Outstanding Tree Farmers of the Year. The theme for this year’s meeting is “Family Forest Ownership – The Gambles and The Rewards” There will be many activities for family forest owners throughout the three days of events. On Thursday, June 26th optional tours will be available for the first 80 people to sign up for the tours. The tour participants will break up into two groups. Half will tour the Roseburg Forest Products Engineered Wood Products Mill in Riddle in the morning and the Douglas Complex Fire in the afternoon. The other half will have the woods tour first and finish with a mill tour. Free online decision support for forest management planning. Developed by Ecotrust. Free decision support for forest planning in Oregon and Washington. Land managers, landowners and biologists are invited to spend a day learning about migratory songbirds and the importance of early seral habitats. The goal of this one-day symposium is to advance our understanding of early seral habitats and how to manage for the species that depend on it. This symposium is FREE. Space is limited so please register early. Welcome to the Forest Tax Symposium Archive! The Committee for Family Forestlands identified a need for understanding, describing and finding ways to improve the myriad of taxes related to forest and forestland ownership that family forest landowners pay. Taxes include property taxes, taxes upon death, income taxes, harvest taxes, and indirect taxes. These taxes potentially affect family forestland managers by encouraging and/or discouraging sound forest management. Tax costs and policies may also determine whether families are able or willing to keep forestland in forest use and/or in family ownership. These taxes contribute to our communities on federal, state and local levels. Many tax, legal and forestry professionals have little understanding of forest and forestland taxes and how to advise their clients about these issues. In partnership with the Oregon Small Woodlands Association and support from OSU Forestry and Natural Resources Extension, Oregon Forest Resources Institute, Oregon Department of Forestry and the Oregon Tree Farm System, CFF sponsored a symposium in January 2015 on these tax issues to describe the breadth of this subject and to identify areas where additional education may be needed or where tax policy and other values may conflict. The symposium was presented in general and concurrent sessions, all of which can be viewed using the video links below. Attorneys who are seeking Continuing Education Credits for watching the videos on this site will need to fill out the CE Credit Request Webform. Those seeking credits will be charged $25/CE credit, and a check, made out to Oregon Small Woodlands Association (OSWA) will need to be received at 187 High Street NE, Suite 208 Salem, OR 97301 before you will receive the certificate of completion. Attorneys will not be permitted to receive credit for hours they already received credit for at the live seminar, but can watch sessions they were not able to attend in person and can request additional credit hours (at the rate of $25/hour). Accountants and Appraisers should contact Brianna at brianna.beene@oregonstate.edu to inquire about CE credits for your professional organizations. This workshop provided technical assistance, tools and resources to guide landowners with fish habitat and passage projects. Half the day was spent in the classroom, and the remainder in the field visiting recent fish passage and habitat projects. The aim is to encourage more forest landowners to understand voluntary fish passage and restoration projects in support of the Oregon Plan. Economic Solutions to Fish Passage for family forestland owners Lucas Hunt, Polk Soil and Water Cons. Dist. The 2015 Oregon fire season was the third record-breaking season in a row. This workshop featured a quick review of the 2015 fire season led by Ron Graham of ODF. Rick Wagner shared what happened during the severe 2015 fire season in Northeast Oregon that burned a record number of private landowner’s acreage. Rick focused on Post Fire recovery, including assistance and advice on preventative strategies to best prepare your woodlands and homes from wildland fire. Eileen a fellow tree farmer represented her family in sharing their personal experience when two large fires (Cornett- Windy Fire) burned together near their ranch in August. She shared insights on surviving the impacts of a large fire including preventative strategies. The workshop will wrap up on a discussion of how to prepare your tree farm for wildfire and what do if a fire occurs led by Steve Fitzgerald of OSU Extension. This workshop provided technical assistance, tools and resources to guide landowners with fish habitat and passage projects. Half the day was spent providing background information and the remainder looking at recent fish passage and habitat projects. The aim is to encourage more forest landowners to understand voluntary fish passage and restoration projects in support of the Oregon Plan. Do you have a succession plan for your tree farm? As American Tree Farm System celebrated its 75th anniversary, it was a good time to look ahead at the next 75 years. Good succession planning is a way of building shared vision and passion for the land among the family. A panel of presenters discussed succession planning and provided insight into important discussions to have with heirs and/or charitable planned giving entities. This family focused event had interactive dialog with time for questions and gaining insight into both communication and legal aspects of succession planning. Private forestland owners and partners in eastern Oregon have been increasingly working together to overcome common challenges and achieve shared goals. These partnerships have taken several forms, such as a landowner cooperative to sell timber, and all-lands fuels reduction and restoration projects across ownerships. These efforts differ in how they are organized, but share a focus on bringing together multiple properties and partners in the pursuit of markets, contractors, restoration funding, or other means to manage local forests. This meeting was designed based on feedback from a survey of forestland owners and partners. It seeks to blend information-sharing and presentations with time for conversation. It is organized by Oregon State University’s Forestry and Natural Resources Extension Service, with assistance from Oregon Forest Resources Institute, Oregon Department of Forestry, American Forest Foundation, and Wallowa Resources. This workshop, designed for forest landowners and wildlife biologists, focused on several forest-dwelling carnivore species in Oregon that are currently being considered for listing under the Endangered Species Act. 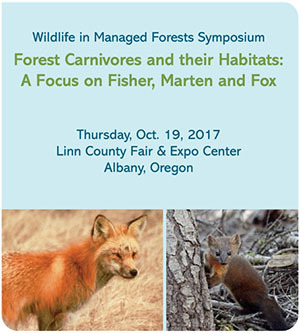 The event, hosted by the Oregon Forest Resources Institute, highlighted the need for collaboration between forestry and wildlife professionals to find ways to manage landscapes to protect the fisher, the Pacific marten and the Sierra Nevada red fox. Desiree Early, Green Diamond Resource Co.